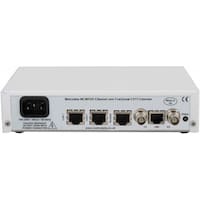 The WCM1101 Ethernet Converter is a Carrier Ethernet Service delivery unit, offering end to end management using 802.3ah OAM, and customer site Ethernet extension from twisted pair 10Mb/100Mb over Clear-Channel or Fractional E1 or T1 leased line services. 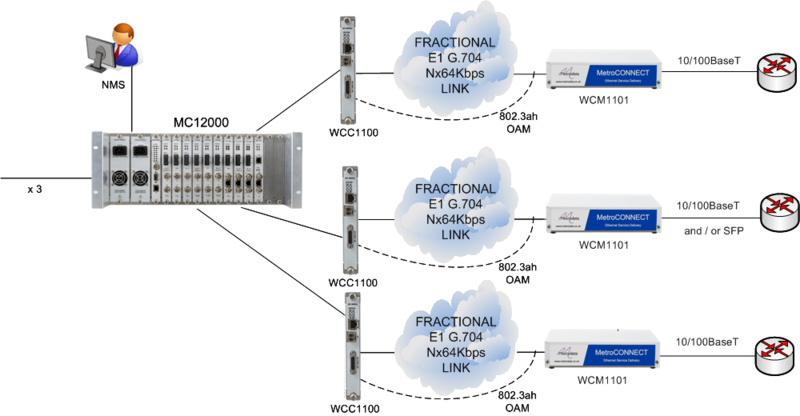 The WCM1101 is a member of the MetroCONNECT family, offering Managed LAN extension over either Clear-Channel or Fractional E1 or T1 Wide Area Networks. The WCM1101 supports two RJ45 LAN interfaces. Over-sized Ethernet frames, of up to 10,000 bytes, are supported. Ethernet VLANs are supported, either by pass-through of existing Tags or by the Push and Pop of Tags on ingress and egress at Ethernet ports. Pre-embedded prioritisation schemes can be honoured, or alternatively prioritisation can be over-written under Management control. Bandwidth limitation per port and per prioritisation can be implemented, providing a mechanism for differentiated QoS for multiple services. Management is offered via each of; Serial Terminal connection, Telnet, SNMP or Web Browser application. Management security is offered via SSH and TACACS+ authentication. Support is also offered for ‘Carrier Ethernet’ Link OAM Management (IEEE802.3ah), enabling status information to be shared with connected equipment if required. In line with all other members of the MetroCONNECT Ethernet Service Delivery family, the WCM1101 supports Metrodata’s ‘zero-touch’ installation process, eliminating the need for skilled resources for remote-site installations. The WCM1101 supports integrated ‘Bit Error Rate Testing’ (BERT), an invaluable aid during both installation and subsequent troubleshooting. This facility enables integrity testing of the WAN link, prior to application of Ethernet traffic, eliminating doubt as to the location of connectivity problems. Ethernet traffic is encapsulated by the WCM1101, for transmission over an E1 or T1 link, using a number of optional schema, including support for the ITU-T G.7040 standard ‘Generic Framing Procedure’ (GFP). The product can be used for both simple Point-to-Point networks, using two WCM1101 products linked via either terrestrial or wireless (e.g. microwave) WAN services, or as part of a Point-to-MultiPoint topology, using the MetroCONNECT WCM1400, 1800 or 1820 products, the MC12000 Ethernet Service Delivery Chassis, or third-party aggregation platforms. The WCM1101 is available in a choice of 100-250 VAC or -48 VDC integrated power supplies. The WCM1101 can easily be rack mounted in either a 1U two unit rack mount kit, a 6U eighteen unit rack mount kit. The WCM1101 is part of a wide range of Ethernet extension products from Metrodata. This application shows an MC12000 MetroCONNECT chassis with WCC1100 modules, supporting multiple WCM1101 Ethernet Converters to Fractional E1 or T1 devices. The MetroCONNECT and WCM1101 together offer Ethernet Extension and Ethernet demarcation, with remote management via 802.3ah OAM. Service delivery is over copper to a Fractional E1 or T1 circuit. Comprehensive remote network management access is available via the MetroCONNECT including end to end remote management using 802.3ah OAM. 10M and 100M Ethernet applications can all be supported, as can Mini Jumbo frames. This application shows an WCM1101 unit being used as the Ethernet demarcation device to deliver a Carrier Ethernet service from an MPLS core network. A choice of Ethernet connectivity is available for the user via the 10Mb and 100Mb Ethernet ports. OAM support means that the WCM1101 can be remotely managed by the central network management system using standards based OAM packets. GFP is supported allowing single ended use with aggregation platforms in the core network. This application shows how a pair of WCM1101 units can be used to offer Ethernet service demarcation and Ethernet Extension functionality either over a Fractional E1 or T1 circuit.